Travis Snider and Eric Thames have lockers on opposite sides of the clubhouse in Dunedin. There's a middle row of lockers dividing the sluggers that might as well represent Blue Jays Nation. There is Camp Snider (209 votes on our poll) and Camp Thames (117 votes). Lunch Box Hero backers are feeling pretty good right now, following another homer today by the voracious meat eater. 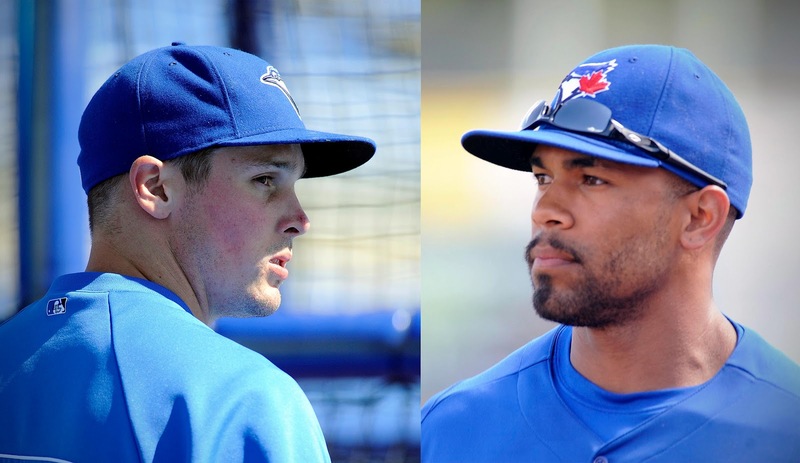 "I like Eric Thames, I really do, but I hope Travis wins the LF job," tweeted @rallycap_andy. I admire how both outfielders are handling this day-to-day race. Thames on the job hunt: "When it's time to play, it's all business. There are no hard feeling whether he wins or I win. We both know that, hey, it's the business side of what we do," he said. When I asked him about his swing and seemingly patient approach right now, he said, "Swing-wise, I feel great. I'm just trying to get my eyes to adjust. There have been pitches I thought were a foot off the plate, but they were right on the black. Right now, I'm just looking to get more at-bats to let my eyes adjust and start picking up spins and getting more comfortable." Thames also complimented Snider, saying, "He's a great clubhouse guy and a great teammmate." Travis Snider takes the lead! With another blast today against the Pirates, that's three homers in as many games for Lunch Box Hero, including bombs against lefties Cesar Cabral and Zach Duke. "#StayHot," Snider hash-tagged yesterday. And he did! A tantalizing Travis Snider homered against the Pirates on Wednesday and threw out another base runner, his third assist of the spring. A day earlier, however, he struck out three times against the Phillies and left my sun-tanning Blue Jays friends (hey, there, nice to finally meet you) shaking their heads in Dunedin, Fla. After the game, I talked with Snider about his evolving swing and the ongoing quest to find his timing -- and the battle with Eric Thames. It's early, I know, and spring training is all about regaining your rhythm at the plate. There's another hitting coach in the picture, too. Snider is focusing on quieting his hands, seeing the ball deeper into the strike zone and "not pulling off" breaking pitches. We chatted for 10 minutes on the topic. Before turning on my voice recorder, I asked him why his swing has a tendency to be late to contact. Here at spring training with the Blue Jays, all eyes are on Sergio Santos, whose fastball and slider are enough to close out games, and now he's refining a changeup. I just love that photo! Today we're at the Jays-Phillies game in Dunedin, watching Ricky Romero throw two scoreless and catching up with Brett Lawrie in pregame. Jose Bautista's setup, load and timing of swing is a thing of beauty. What is Robinzon Diaz doing right now? Forgive me if Brad Emaus seemed a bit out of place on a practice field at Red Sox spring training, in the afternoon, grinding it out while big leaguers were done for the day -- already fishing or golfing. After all, Emaus was the opening day shortstop for the Mets last season. Didn't quite work out, though. Today he's looking for a minor-league infield job with the Sox ... "Brad's a good offensive player," Red Sox general manager Ben Cherington said. "For whatever reason, he's was running out of opportunity. We got him into camp, and we'll get a chance to know him better this spring. We're hopeful he can help us, more likely, at the minor-league level to start. He's a guy that's always hit. We'll see if that translates to Boston." More on Emaus and ex-Blue Jays Jesse Carlson in my baseball column for the New Hampshire Union Leader. Cherington on Carlson: "He had one really good year in Toronto (in 2008). He's mostly a matchup-lefty. Low arm angle and good slider. He gives lefties fits when he's going well." BRADENTON, Fla. -- Bling in Bradenton! That was the pregame theme as members of the 2011 Fisher Cats got their first look at the Eastern League championship ring before today's game against the Pirates. 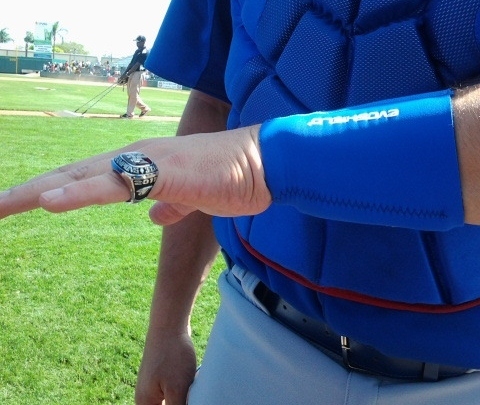 Fisher Cats team photographer Kevin Littlefield, who was given a ring for all his hard work through the years, showed it off following batting practice ... "It was awesome. I can't even describe it with words, when you see the symbol of all the hard work," said Travis d'Arnaud, who played against his older brother, Pirates infielder Chase. Travis Snider drove in three runs, and catcher Jeff Mathis made a "web gem" (John Farrell's words) in the fifth inning, pouncing on a well-placed bunt by Alex Presley ... Anthony Gose put on a display of speed and athleticism, scoring from second base on a squib grounder to the right side during Toronto's 8-5 win. Hard to fathom, I know. Gose said he just kept going on the Snider chopper, and, luckily for him, Pirates were caught sleeping ... I asked Gose after the game, "Were trying to show off your speed or what?" He replied, "Gotta do something!"